I am delighted to introduce our next spotlight guest, the very talented and beautiful Bea Valint! 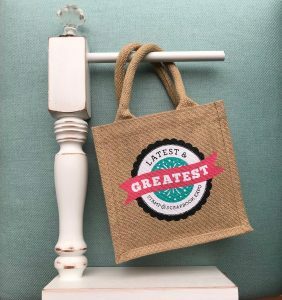 Tell us a little bit about yourself and how you got started crafting: I’m Bea, a thirty-something mum of three boys and one little girl from Hungary. I’m an economist; before the kids I worked for an international bank. I had created handmade photo albums before I learned it is called scrapbooking. I love playing with papers and adore taking photos, and in scrapbooking I can do both of them! 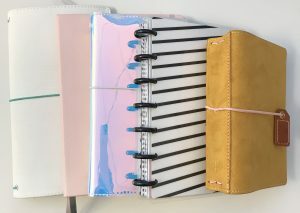 I started with creating tons of mini albums as a way to documenting our memories, but when my sister-in-law showed me some layouts on Pinterest in 2013, I also fell in love with creating 12 x 12″ pages. Favorite thing to create: To tell the truth, I can’t choose! I love watching my children look through our Project Life album again and again. It warms my heart and recording our memories in this way becomes more and more important. I also enjoy creating mini albums and bringing together our memories under one theme in a playful way. As for layouts, creating a 12 x 12″ page is all about creativity, emotions, and femininity for me! What do you love about this hobby? 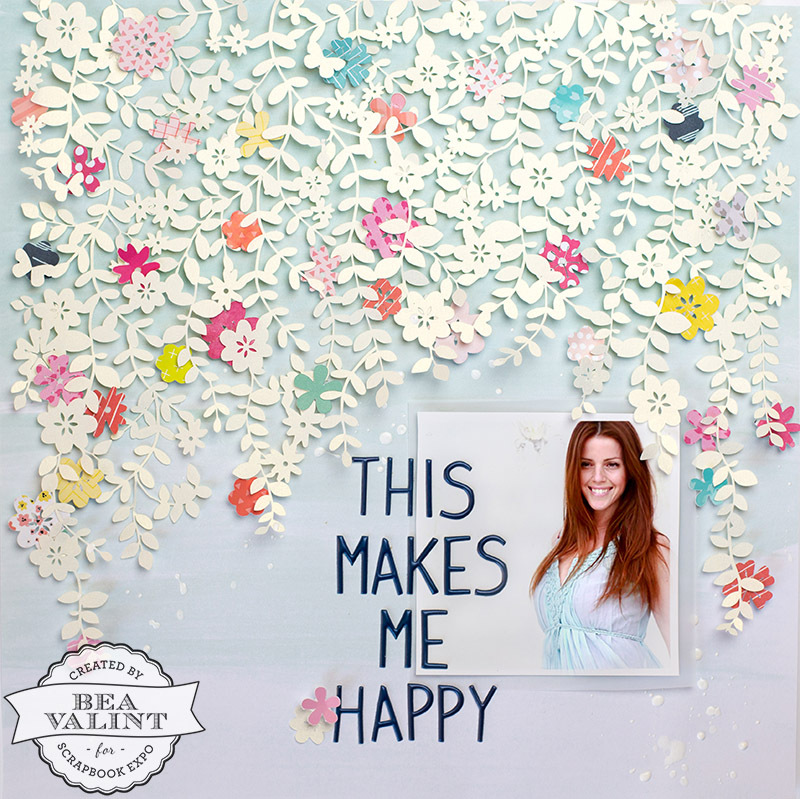 I love expressing myself through my creations and photos and admire the beautiful things that other scrapbookers create. So many unique styles, so many different techniques, and I find so much of them simply perfect!! 2. I’m completely obsessed with paper flowers. 3. My great grandfather was a European champion racing driver, my husband is a hobby racer, and two of my sons are national champion gokart racers… I spend a lot of weekends next to the gokart track with crossed fingers! But I haven’t got layouts with gokarting at all. 4. During my time at the university I was crazy about travelling and I ranged half of the world working as a fashion model. Now my favourite thing to wear is my running shoes, I put on make up only once in a month, and I love hanging out at home with my children. Times are changing! 5. My happiness level is often directly connected to the weather… sunshine is my buttery! 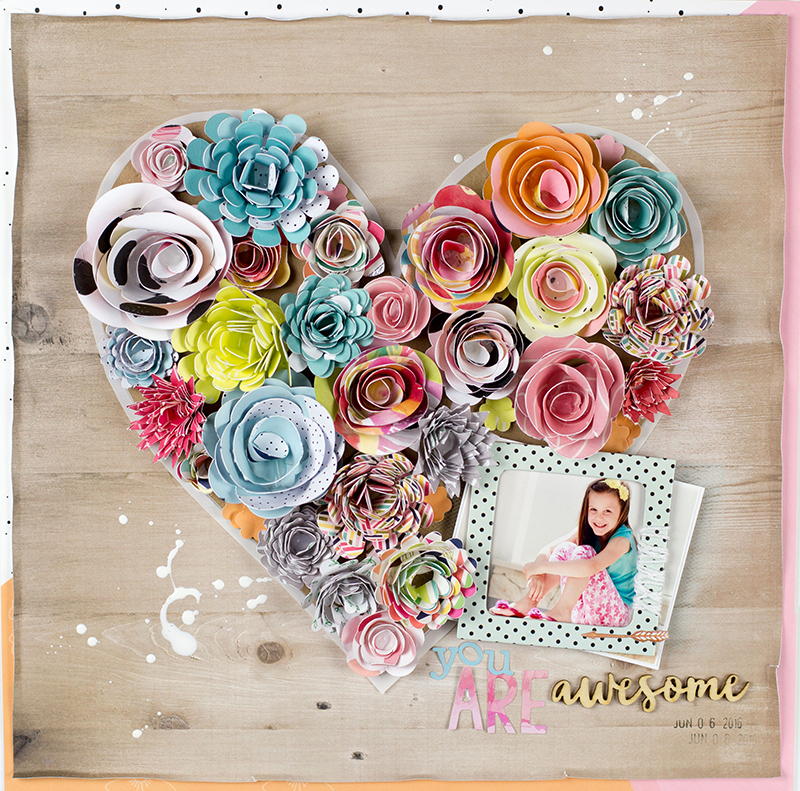 When creating this layout, I wanted to include a bit of everything I love in scrapbooking. A cut file I designed, bright colors, paper flowers, a big and meaningful title, favourite picture; these make me happy!! If you like this branch-flower cut file, I would be happy to share with you! You can download it from here, or visit my blog for more freebies. There is nothing better than flowers! It’s no secret I am a fan of scrapbooking and use flowers a lot. This page is certainly no exception. You can see the process video here. I love flip-flap albums, but to tell the truth I never enjoyed measuring with the ruler, so I decided to create a mini album cut file. Yay, no ruler, no scoring board, and every page fits perfectly! 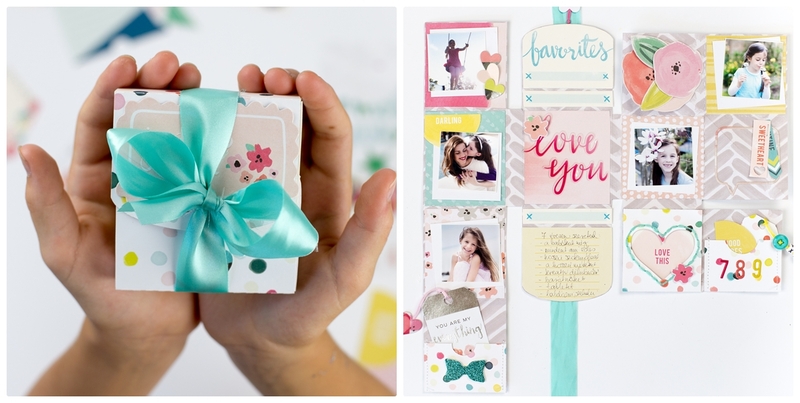 I made tons of this mini album – it’s the perfect present for every occasion! This layout came about because I had an idea to create colorful, layered butterflies with gelatos and patterned paper. 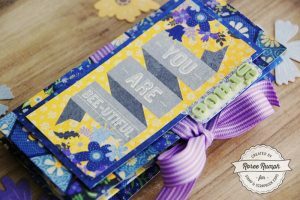 Adding colors with gelatos guarantees a beautiful effect on layouts! You can check the process video here. This layout has my heart. For the background I used a quilling pattern I found on Pinterest. I used the amazing Fancy Free collection and I used only one paper. Thank you so much for joining us today! I hope you’ve been inspired by Bea’s lovely projects! This entry was posted in Designer Spotlight, Scrapbooking, Spotlight and tagged 12x12 layouts, Bea Valint, Scrapbooking, spotlight. Bea’s work is just breathtaking. I hadn’t seen the butterfly one before today, I think it’s my new fave. Thanks Paige bringing such a gem to our attention. Love Bea, Love her style and I really can’t wait to see what the future holds for her. Your work is so inspiring! Love it!